Advancements in food genomics, particularly high-throughput or next-generation sequencing, are allowing scientists and regulators to detect and identify foodborne pathogens with unparalleled speed and accuracy. By the end of this year, laboratories at FDA, USDA’s Food Safety and Inspection Service, and the CDC will rely almost exclusively on whole genome sequencing (WGS) as their main surveillance tool to differentiate strains of bacteria and identify related clusters of infections. But as the world’s food supply becomes increasingly interconnected, there is also a growing recognition that WGS and related technologies must become more widespread, particularly in economically developing food-producing countries. The U.S., for example, imports foods from about 200 different countries, including 90 percent of our seafood and at least half of our fresh fruit, depending on the season. Today, high-throughput sequencing “has become progressively faster and cheaper, providing higher quality and longer and larger number of reads, resulting in better resolution and reproducibility,” says Behzad Imanian, PhD, research assistant professor at the Institute for Food Safety and Health (IFSH). 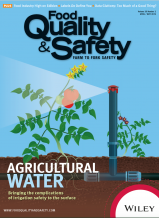 “The food industry is showing great interest in this technology and many of its members have already invested in, experimented with, or even implemented it in their research and development procedures,” Dr. Imanian tells Food Quality & Safety magazine. But expanding food genomics will require overcoming numerous challenges, including cost, training, and data handling and storage. There are also unresolved legal, privacy, and technical standards issues, some of which still persist in the U.S. Nevertheless, governments and private researchers are working to expand WGS and related technologies domestically and internationally. Researchers at FDA’s Center for Food Safety and Applied Nutrition (CFSAN) are making WGS bioinformatics tools and data freely available through an open-source, cloud-based platform called GalaxyTrakr. This new platform “provides a user-friendly and cost-effective solution for industry and other partners to address their bioinformatic needs,” says James Pettengill, PhD, a biostatistics and bioinformatics geneticist at CFSAN. Currently about 140 researchers in 42 locations worldwide are using GalaxyTrakr, with 15 new users signing on each week. WGS can map the genetic sequence of pathogens and other organisms with such precision that researchers can distinguish between different strains of a bacterium or even slight variations by geography within the same strain. “Just as the Hubble telescope revealed previously unsuspected star clusters in the darkest areas of the sky, so public health surveillance using methods with better resolution can identify clusters of infection that were previously missed,” says Robert Tauxe, MD, director of CDC’s Division of Foodborne, Waterborne, and Environmental Diseases.